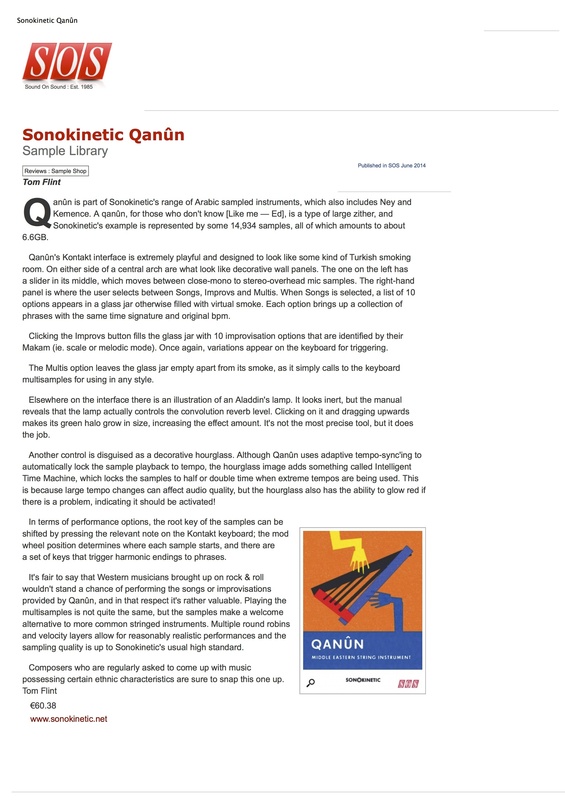 Sonokinetic BV is proud to announce this library of a multisampled and performance sampled Qanun. This instrument complements our other Arabic instruments such as Ney and Kemence to build an ethnic ensemble. The Qanun has been played for centuries and feels right at home in our collection of deep sampled ethnic instruments and vocals. The Qanun (also known as Qanoun and Kanun) is a dulcimer or zither-like instrument of 81 strings stretched over a frame and plucked with the fingers or picks. Its distinctive tone comes from the grouping of strings and levers which create the scales. Our Qanun was recorded in Istanbul by our long-standing friend, expert engineer and composer Ceyda Pirali in high fidelity audio quality. The player is the renowned performer Gunay Celik who learnt his craft at the State Turkish Music Conservatory. He studied the playing styles and techniques for many years before becoming a master in 1992. He taught Qanun at university level and has played with the İstanbul University Ensemble and Ayangil Turkish Music Orchestra. His credits also include many performances with Turkish radio and television. 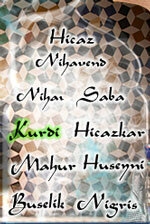 Currently, Gunay is working at the State of Turkish Classical Music Ensemble. He has kindly agreed to allow us to capture his unique playing style with traditional songs and hundreds of improvisations. 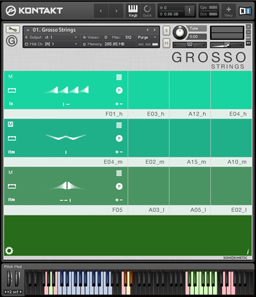 For the multisampled playable instrument we have captured multiple round robins and velocity layers so that you can play the instrument chromatically. 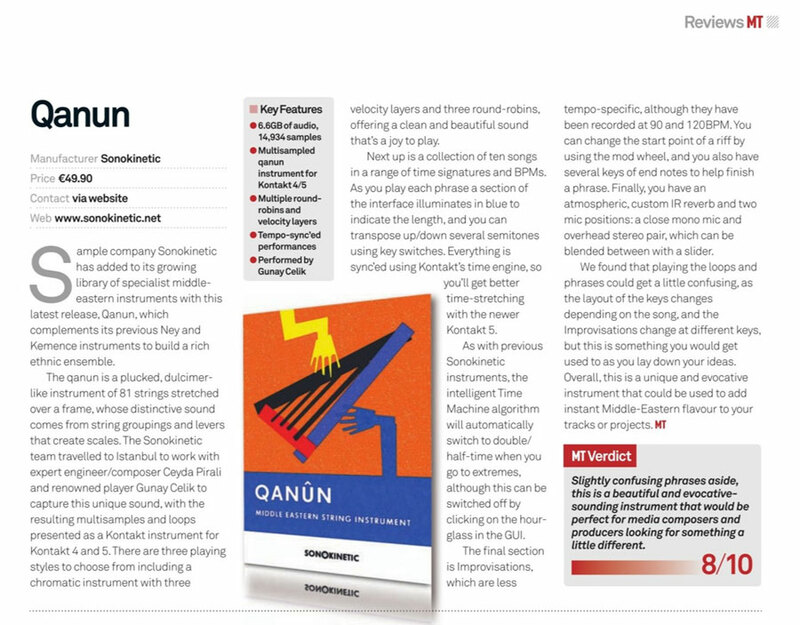 For the improvisations and songs, Sonokinetic Qanun features tempo-synced performances in root keys. 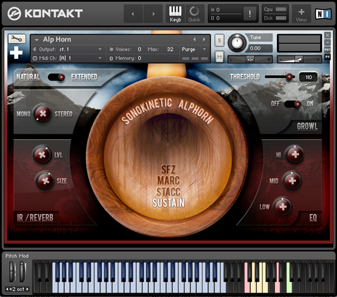 These samples are wrapped in an intuitive interface which makes playing this instrument a pleasure. In addition, the convolution reverb creates an unparalleled ambience, evoking the spirit of Arabia. 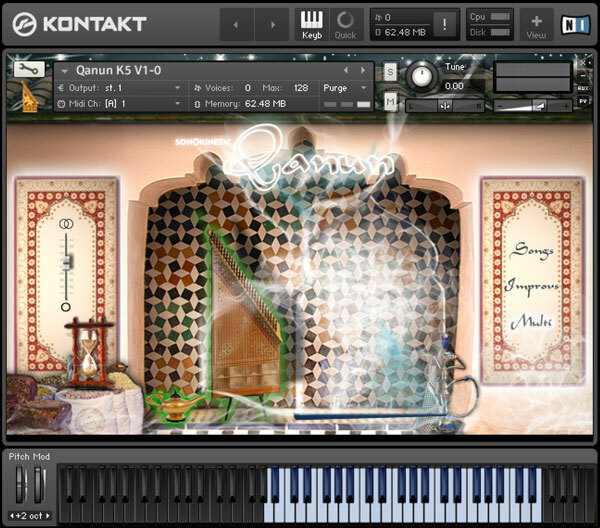 The main UI for Qanun consists of several controls including selection for Songs, Improvisations and a Multi instrument. 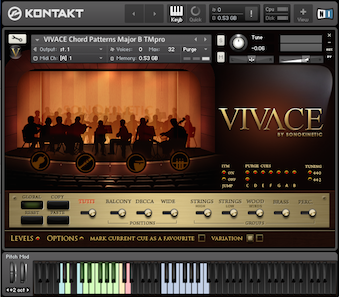 The interface also features stereo, reverb, and Time Machine controls. Choose either performance-sampled Songs, Improvisations or playable Multi by clicking the relevant legend in the right-hand side of the interface. 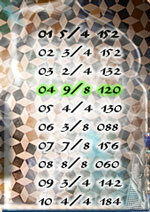 For Songs, the interface will change to display a choice of 10 different songs, their time signature and original BPM. 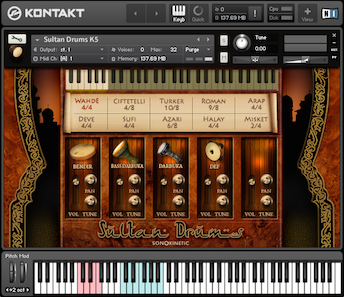 With Improvs, the interface will display a choice of 10 improvisations, named after their respective ‘Makam’ (eastern musical mode/scale). When composing, we find it particularly intuitive to see what length a current phrase would be. Since not all phrases are cut out with computer science in mind, they are more focused on musical and artistic expression, there’s a lot of variety in length and duration of a phrase. Hence the “Phrase Indicator” that shows you the remaining length by steadily following the phrase progression, filling the display with a blue hue from bottom to top as the phrase plays. The slider to the left of the interface can be used to mix the ambience of the playback. The bottom position uses close mono samples and the upper position uses stereo overhead microphones. Use the slider to mix between these two positions. This instrument can be played chromatically just like a regular piano. The blue keys indicate the playable range. Use the sustain pedal to hold notes. If you find that the sustained noise floor of very fast sustained playing is becoming too loud reduce the Max Voices number in Kontakt from the default 128. We would suggest 32 or less. The songs and improvisation phrases can be played in different root keys and are all tempo-synced. Choose the root key of the phrase with the lowest red keys. The blue keys indicate the playable keys which trigger phrases. The green keys trigger ending notes for the phrases. When activated each ending note will trigger a single sample or harmonic ending to a phrase in the corresponding key. Please note that the songs have been performed in specific keys so not all songs are available in all keys. To maintain sound quality we have limited the root keys to 2 semitones above and below the original key of each song. There are 2 sample sets for each of the 10 different improvisations. One is recorded at 90 BPM and another at 120 BPM. The Qanun scripting will automatically choose the most appropriate improvisation samples according to your host project tempo. Be aware that if you change the tempo of your composition then an alternative improvisation may be played. To remedy this we would suggest using the original .NCW samples instead and using your DAW’s time stretching function.